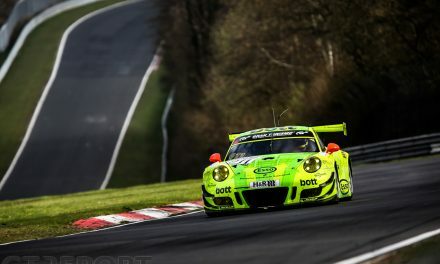 ➤ Rowe Racing took the first win of the 2019 VLN season. In the 65. ADAC Westfalenfahrt the BMW M6 GT3 team overtook the Manthey Racing Porsche 991.2 GT3R in the final lap of the race. Some discussion took place shortly after the finish regarding the legality of John Edward’s move at the end of a Code 60 Zone at the Karussell, but it soon became clear the flag had indeed changed from Code 60-pink to race-green. ➤ Click HERE for the VLN1 race report. 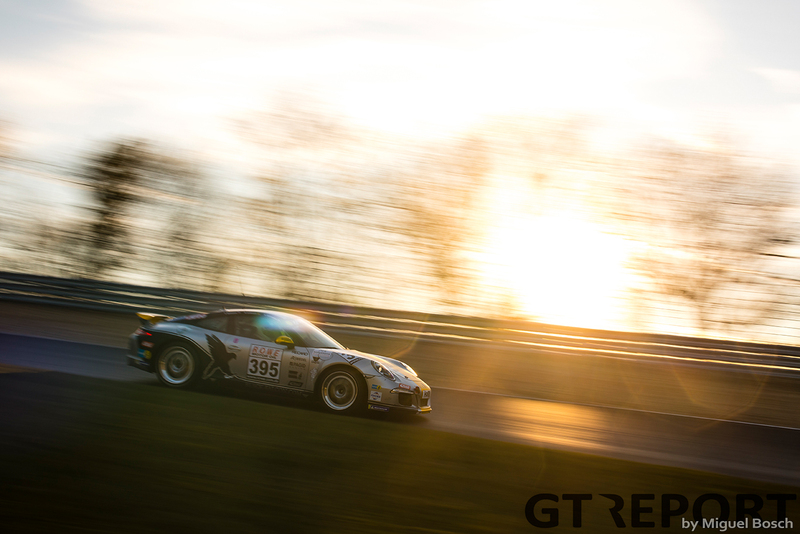 ➤ Click HERE for the VLN1 photo gallery. ➤ Click HERE to read our interview with John Edwards. ➤ Click HERE to read our interview with Nick Catsburg. 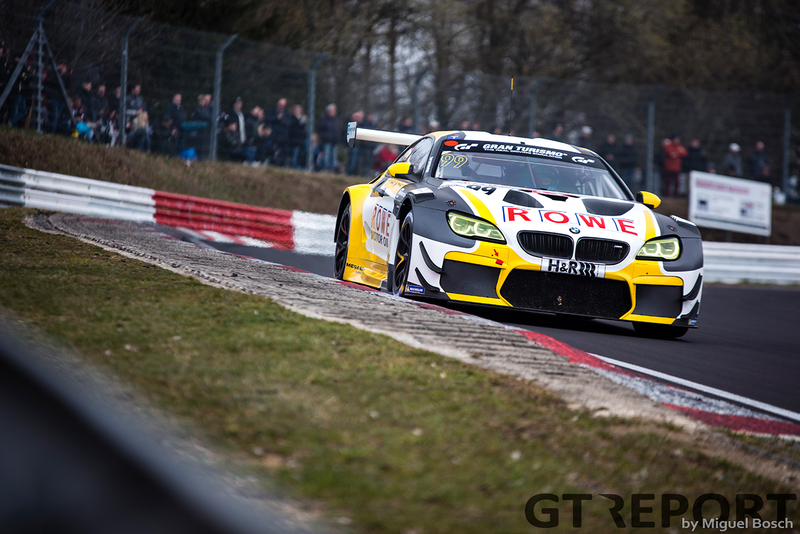 ➤ Rowe Racing’s pole position was the team’s very first in VLN with BMW. The previous Rowe Racing pole dates back to VLN6 in 2015 when the team still raced the Mercedes-Benz SLS AMG GT3. The 2016 Nürburgring 24 Hours Qualification Race counts as the team’s last pole position at the Nordschleife until last weekend. ➤ Due to a 4-hour delay waiting for the fog to clear, VLN1 was shortened to 2 hours and 45 minutes. This is the shortest distance over which a VLN race can be officially scored. Winner Rowe Racing crossed the finish line after 20 laps with a total race time of 2h 53m 30.383s. ➤ Of the 167 cars that started the race, 127 were classified at the finish. ➤ A crash on the opening lap at the Veedol-Schikane took out three front-running cars. Unwilling instigator Fabian Schiller spun his J2 Racing GetSpeed Performance Mercedes-AMG GT3 coming out of the chicane, setting a cascade of accidents in motion: Yelmer Buurman’s Black Falcon Mercedes-AMG GT3 first smacked into the back of the Manthey Racing Porsche 991.2 GT3R of Earl Bamber who tried to avoid the spinning Schiller, and then had a heavy impact with the GetSpeed AMG that sent the Black Falcon car up in the air. All three drivers remained unharmed, but their cars were forced to retire due to the damage sustained. ➤ Patrick Pilet did not mince words when recounting John Edwards’ overtake on the final lap. In an interview with VLN-Fanpage, the Manthey Racing driver claimed he couldn’t see the flag as he was behind another car and the green flag was not waved as it should be. ➤ Tim Scheerbarth is back with Black Falcon after a 2-year break in which he twice won the Porsche Carrera Cup class: First with GetSpeed Performance and last year with Mühlner Motorsport. This reunites the German driver with the team he won the VLN championship with back in 2011, to take on the SP10/GT4 class in the Mercedes-AMG GT4 alongside co-drivers Tobias Müller and Tristan Viidas. With a commanding victory in VLN1, Scheerbarth’s return has begun promising. ➤ Jeroen Bleekemolen also reunited with an old friend. The Dutchman got back behind the wheel of the SRT Viper GT3-R run by Zakspeed. Although not the same chassis, it’s the same model with which he won the 2014 IMSA United SportsCar Championship. 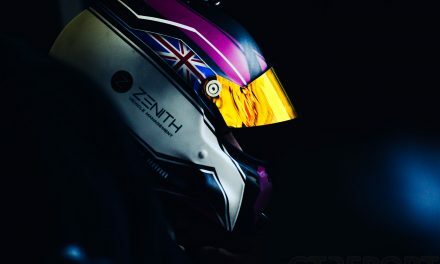 ➤ Despite putting the Peugeot 308 TCR up for sale at the end of 2018, Nett Motorsport has kept its SP2T championship-winning car and gave it a 2019-spec upgrade. The team began its renewed title bid with victory in the two-car class and a 65th overall finish. Joachim Nett, Jürgen Nett and Bradley Philpot are back behind the wheel of the Peugeot for 2019. 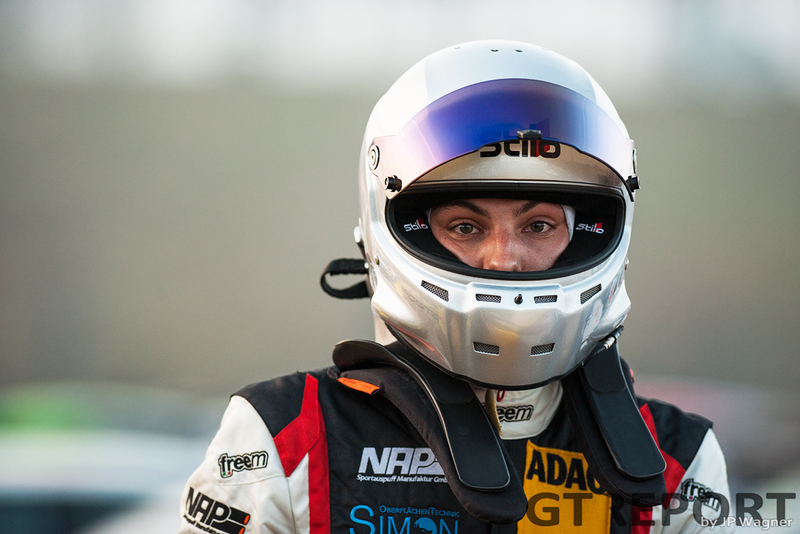 ➤ A call-up on Friday secured Nico Menzel of a last-minute drive with Mühlner Motorsport in the Porsche 718 Cayman GT4 CS co-driving with Moritz Kranz and Michael Rebhan. It was a rather successful outing for the local driver as he took the win in the Cayman Trophy class. Menzel’s SP9/GT3 season in the Eifel with Wochenspiegel Team Monschau came undone when the team announced its exit from VLN just weeks prior to the start of the season. ➤ Waldow Performance youngsters Finn Unteroberdörster and Janis Waldow have picked up where they left off in 2018 with victory in the VT2 class. The drivers of the number 507 Renault Mégane RS took the win with a lap advantage over the second-placed car. ➤ Scuderia Cameron Glickenhaus has switched from Dunlop to Michelin tyres. The change in tyre supplier has consequences in how the SCG003c is set-up, as explained by James Glickenhaus. Click HERE to read our interview with the team-owner. ➤ Pirelli has signed on as the sole tyre supplier to the SP10/GT4 class in 2019 and 2020. Teams racing the Italian rubber seem to be content with the product delivered, with one team praising the choice of different compounds and increased performance window over a complete stint. ➤ After many years of loyal service, XXL Racing’s VW Jetta has given up the ghost. In a dramatic crash in qualifying, the old VW Jetta rolled over several times before coming to a stop on top of the guardrail at Brünnchen. Although the driver walked away relatively unscathed, the car is a near-total loss. To help the private team get back on its feet and continue racing, fans have begun donating money. ➤ 2016 Nürburgring 24 Hours winner Manuel Metzger has broken his leg in a bicycle accident days before the season premiere, putting his participation in the ‘N24’ in jeopardy. 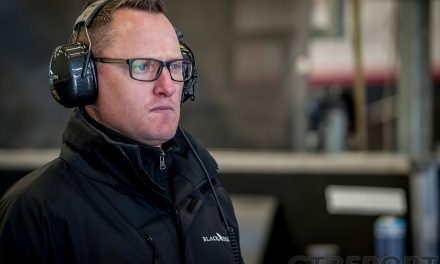 The AMG works driver for the Nürburgring was scheduled to race the complete Blancpain GT World Challenge Asia series and VLN with Black Falcon in the SP7-class Porsche, as well as the Nürburgring 24 Hours in the factory-backed Black Falcon Mercedes-AMG GT3. Metzger has set his sights on a full recovery in time for the Nürburgring 24 Hours. 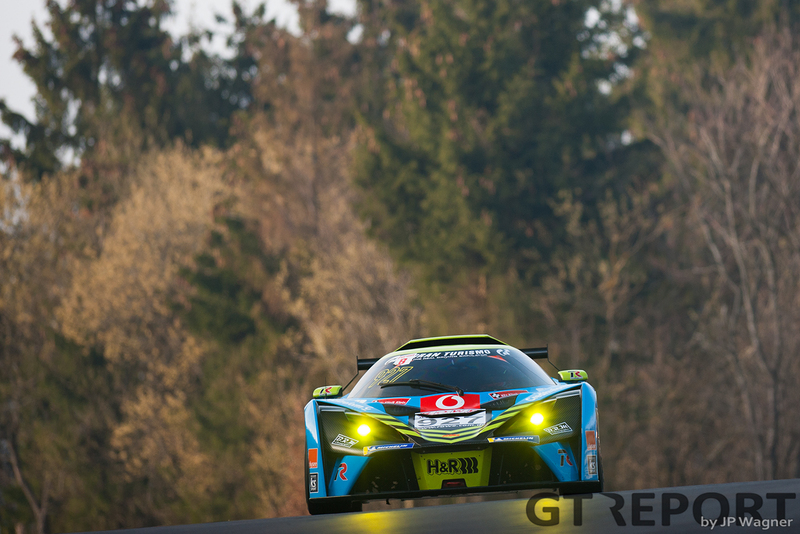 ➤ Among its fleet of three cars at VLN1, Teichmann Racing entered a ‘Permit B’ KTM X-Bow GT4 for drivers Florian Bodin, Reinhard Kofler and Stephan Brodmerkel. The trio raced a power-restricted KTM X-Bow GT4 with added weight to qualify for their Nordschleife Permit A which would allow them to race high power race cars such as the standard KTM X-Bow GT4. After earning his Permit A, Florian Bodin is planned to move into the unrestricted KTM X-Bow GT4 to take part in the Cup X for KTM X-Bow GT4s that starts at VLN3. The 25-year-old earned his ride with Teichmann Racing as part of a sim racing competition. Bodin has a real-life motorsports claim to fame as well: In 2017 he was crowned champion in the DMV BMW 318ti Cup. 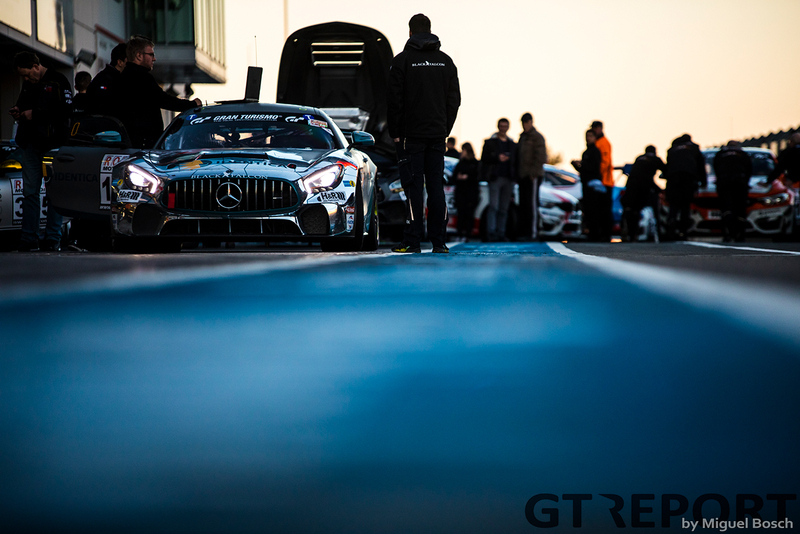 ➤ With 20 cars starting in the SP9/GT3 class, first place in the overall VLN championship standings is occupied by Rowe Racing drivers Nick Catsburg, Marco Wittmann and John Edwards. The trio scored 9.75 points. 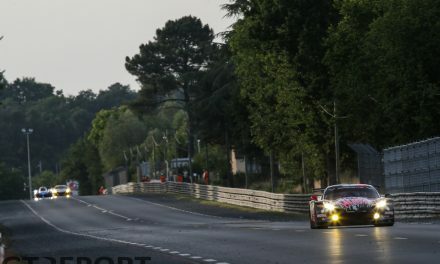 However, SP9/GT3 is notorious for a huge drop in participants after the Nürburgring 24 Hours, making it unlikely this year’s champion will come from this class. Instead, with 18 starters last weekend, V4 seems to be the most likely class to again provide the champion: Sorg Rennsport BMW 325i e90 drivers Torsten Kratz, Oliver Frisse and Moran Gott are a close second in the championship after scoring 9.72 points with their class win. ➤ In the Rowe Speed Trophäe, the championship awarding points to the top 20 outright finishers, the number 99 Rowe Racing BMW M6 GT3 is leading the charge with 35 points. To give teams an incentive to go for the outright VLN championship, the organization has found a sponsor in Rowe Motor Oil. The high-performance lubricants producer awards a total of 25,000 euro at the end of the season to the top teams in the long-ignored Speed Trophäe championship. 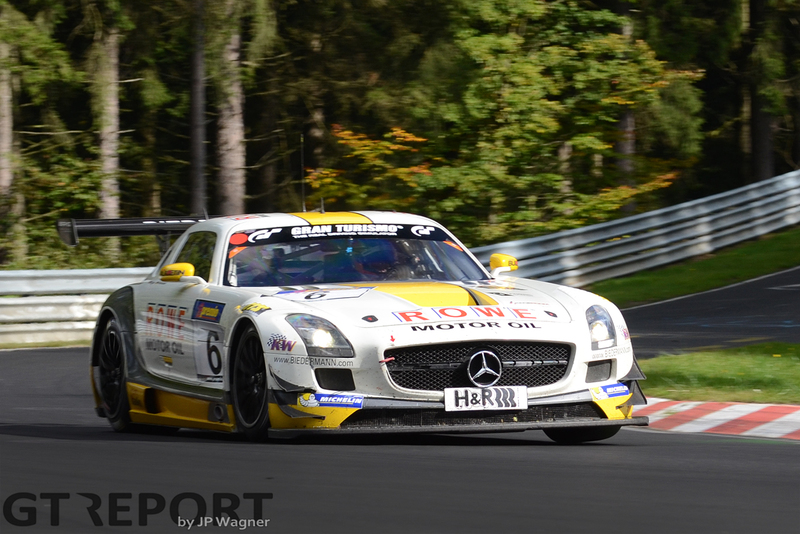 ➤ The next round in the VLN championship takes place on 13 April with the 44. DMV 4-Stunden-Rennen.